Last November I saw an episode of DWDD where a very enthusiastic artist silenced Matthijs van Nieuwkerk with his stories about softening our cityscape. A lot of beta-jargon, but he aims to romanticize buildings with new forms of technology in light and sound. His latest upgrade is to the Hotel school, with a high-tech garden called Boo. 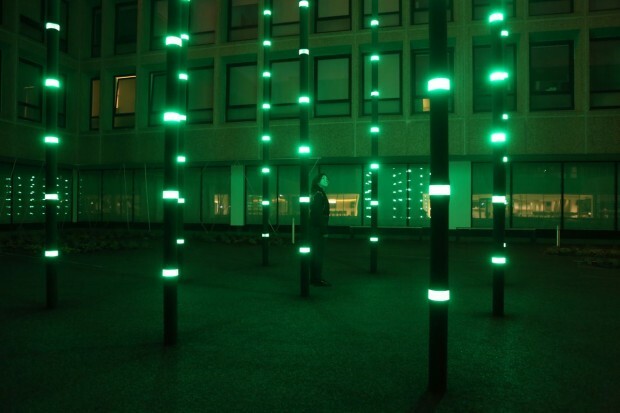 The grey complex is now enlightened with green pillars who echo your and their own Asian-inspired voice. Still a bit futuristic; time for some questions. Hi Daan Roosegaarde, in an interview you said you want to add ‘sensual layers’ to buildings, what does that mean? Marbles is a successful light project in Almere, which you also call an ‘interactive landscape’, how important is this vice-versa form of contact for you? The garden of Boo is Asian-inspired, what explains your affection with this continent? So fewer hours online, more in technological but romantic gardens, will this be the future? With his idealistic enthusiasm Roosegaarde sort of convinced me. These modern hippie projects might actually bring people together offline a little more, and besides that it’s a unique way of experiencing art. Go take a look. When: Best time to visit is when the sun has set.